Volunteers with the Lee College Senior Adult & Travel Program have collected and washed loads of clothes, donated money, provided meals and offered a helping hand to those impacted by Hurricane Harvey. The program invites all senior adults in the community to enjoy a night away from the rigors of the recovery process Tuesday, Sept. 12, with free entry and food at the Lady Rebel Volleyball home game against San Jacinto College. From left: John James, Carolyn James, Karen Knight, and Carolyn Buntin. BAYTOWN, TX — The Lee College Senior Adult & Travel Program invites senior adults — particularly those impacted by Hurricane Harvey or hard at work helping their affected neighbors – to enjoy a night away from the rigors of the recovery process next week when Lee College Volleyball takes on conference rival San Jacinto College. The Lady Rebels will hit the court at 6 p.m., Tuesday, Sept. 12, in the Sports Arena on campus. Seniors will get free entry to the game and free pizza, popcorn and drinks with a photo ID. The program will also be collecting canned goods to support the Lee College Food Bank, which helps students in need — and the Lady Rebels have designated the game “First Responders Appreciation Night” in recognition of the first responders across the community who helped to rescue and assist those in need during the storm. For more information about Senior Adult Night at the Lee College Volleyball game against San Jacinto College, contact the Center for Workforce and Community Development at 281.425.6311. BAYTOWN, TX – After whisking travelers away this year to Cuba, France, the Canadian Rockies and the Grand Canyon, the Lee College Senior Adult & Travel Program invites the community to learn more about its next round of tours: excursions to Switzerland, Italy, Yellowstone and Grand Teton National Parks, Cape Cod and its Islands, and Santa Fe and Albuquerque, New Mexico. 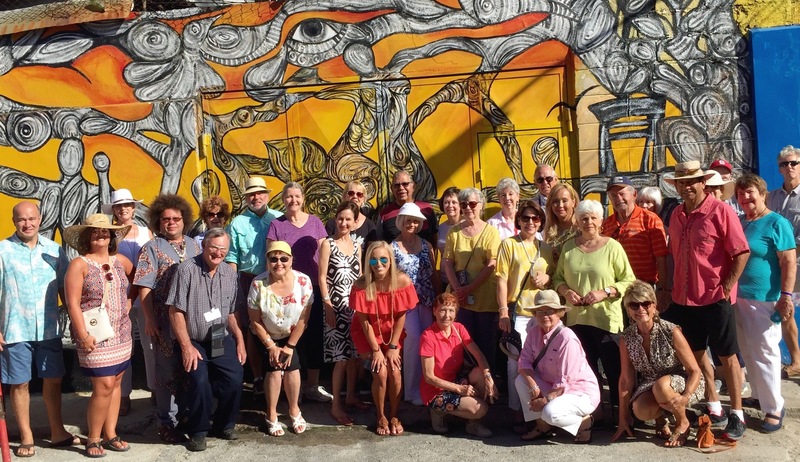 The Lee College Senior Adult & Travel Program whisked participants away on an unforgettable tour of Cuba in 2016 that included visits to Old Havana and cultural sites throughout the country. A free showcase of the tours planned for 2017 is set for Tuesday, Oct. 18, in Tucker Hall on the Lee College campus. The Travel Showcase of 2017 Tours will be held 5-7:30 p.m., Tuesday, Oct. 18, in Tucker Hall on the Lee College campus. Program Manager Lynne Foley and Collette Tours will provide in-depth presentations on each trip, including a review of daily itineraries and information about costs and registration. Admission is free and open to the public, and refreshments will be served. For 28 years, the extended travel offered through the Senior Adult & Travel Program have provided more than 1,500 adults with the opportunity to journey to different regions around the globe — from the United States and Mexico to England, Scotland, Ireland, the Netherlands, Belgium, Croatia, Slovenia, Italy, China, Australia and more. On the 10-day Alpine Lakes & Scenic Trains tour set for May, travelers will experience Switzerland and Lake Como, Italy, complete with wine tastings; an island dinner; rides on the Golden Pass, Glacier Express and Bernina Pass trains; a cruise on Lago Maggiore and the Lake Como Ferry; and visits to Lucerne, Zermatt, Mt. Matterhorn and St. Moritz. Travelers on the seven-day National Parks & Wild West tour in June will explore Yellowstone and Grand Teton, Old Faithful geyser, Salt Lake City, Park City, the Olympic Village and the National Museum of Wildlife Art. They will also enjoy a recital of the Mormon Tabernacle Choir, a cruise on Jenny Lake and an authentic chuck wagon dinner. The tour of Cape Cod & The Islands in August will take travelers to Nantucket and its Whaling Museum, Hyannis Port, Martha’s Vineyard, Boston, Plymouth Rock and Newport, R.I. In October, travelers will embark on the seven-day Albuquerque Balloon Fiesta tour, featuring sunrise and midnight balloon launches; an adventure drive along Route 66; a culinary class and dinner at the Santa Fe School of Cooking; and visits to the Museum of Nuclear Science and History, Old Town Albuquerque, the Indian Pueblo Cultural Center and Turquoise Trail. Online registration for the 2017 tours will open at 7:30 a.m., Wednesday, Oct. 19. Travelers can register in person beginning at 7:30 a.m., Thursday, Oct. 20, at the Center for Workforce and Community Development at 909 Decker Drive in Baytown. For more information about the Lee College Senior Adult & Travel Program and the upcoming Travel Showcase of 2017 Tours, contact the center at 281.425.6311 or visit www.lee.edu/workforce. BAYTOWN, TX – There’s still time to join the Lee College Senior Adult & Travel Program for bus trips this month to two special theatre productions: the “Bridges of Madison County” under the stars in downtown Houston, and “Barefoot in the Park” at the intimate A.D. Players Theater in River Oaks. “The Bridges of Madison Country” trip is set for Tuesday, Jan. 19. Participants will leave Baytown at 4:45 p.m. and travel into downtown Houston for dinner before the show, a Tony Award-winning musical adaptation of one of the most romantic stories ever written. The fee for the trip is $45, which includes tickets and transportation. The “Barefoot in the Park” trip is set for Thursday, Jan. 28. Travelers will board the bus in Baytown at 4:30 p.m. and enjoy dinner in the Galleria area before the show, written by Neil Simon and performed by one of the largest resident theater companies in the city. The $36 trip fee includes tickets and transportation. Registration for bus trips is ongoing; seats are filled on a first-come, first-served basis with a waiting list in case of cancellations. To sign up, call the Center for Workforce and Community Development at 281.425.6311 or visit in person at 909 Decker Drive in Baytown. BAYTOWN, TX – The students in Cindy Barny’s Life Skills class for the intellectually disabled are like many of their Lee College peers: They enjoy using the computer and learning new things, love spending time with their friends at school and look forward to all the jingling bells and whistles of the holiday season. For the last four years, their festive fun has included a holiday dinner hosted for the students and their caretakers by the Senior Adult & Travel Program. Both the Life Skills and Senior Adult & Travel programs are part of the Center for Workforce and Community Development. “A lot of us know and love someone with an intellectual disability, so we thought this would be a fun thing to do,” said program manager Lynne Foley. At this year’s dinner, her team of volunteers decked the classroom in red and green decorations; served up plates of pasta, salad and garlic bread; passed out holiday gifts; and led several rounds of bingo for the excited students and their families. “We take so much more from them than we would ever be able to give,” Foley said. After more than 20 years teaching the Life Skills class, Barny knows firsthand the positive impact that her students — whom she lovingly refers to as “friends” — can have on the lives of the people who know and care for them. It was Barny who started the program at Lee College, with the goal of providing post-secondary education and socialization for intellectually disabled members of the community. “As people, they finish high school and want to go to college, too. They’re so proud to be Lee College students,” said Barny, who teaches the class how to use computers, navigate the campus, work with money, discuss current events and interact with others, among other skills. That’s just what Barry Hawkins discovered after enrolling his son, Jason, into the Life Skills program earlier this semester. Jason insists on attending class meetings by himself, leaving his father to his own devices for the weekly two-hour session. Annette Venegas has been one of Barny’s students nearly as long as the Life Skills program has existed. Her parents, Rudy and Susan, credit the class and instructor for being a bright spot amid the challenges of their daughter’s life. Senior bus trips planned through Jan. The Lee College Senior Adult & Travel Program will host nearly a dozen bus trips and special events through January for adults with a spirit of adventure and the desire to make new friends — including daylong excursions to destinations of interest throughout Baytown and Houston. Registration for bus trips, classes and events is ongoing; seats are filled on a first-come, first-served basis with a waiting list in case of cancellations. To sign up, call the Center for Workforce and Community Development at 281.425.6311 or visit in person at 909 Decker Drive in Baytown. Program Manager Lynne Foley will also host a showcase of the 2016 tours to the Grand Canyon, Canadian Rockies, Cuba and France from 5-8 p.m., Monday, Nov. 2, at 909 Decker Drive. For more information, visit www.lee.edu/workforce and see the FOCUS Newsletter. Dress comfortably for a full morning of strolling through exhibits at the festival, followed by a jaunt to the Houston Tunnel system for a unique lunch under the city streets. Fee: $17. Enjoy a light dinner before cheering on the Lady Rebel Volleyball Team at their last home game of the season. No fee. This popular class satisfies all state insurance requirements for a discount but cannot be used for a traffic violation. Checks and money orders must be made out to AARP: $15 for members, and $20 for non-members. View the exhibits at the Eddie Gray Wetlands Center in Baytown – including live alligators – and have lunch in the Baytown Nature Center Pavilion before a guided tour. Fee: $12 for lunch only. Join the Lee College Veterans Center for a celebration of its fourth anniversary that will honor all military service members, past and present. Refreshments will be served. No fee. Take an informational tour of Wismer Distributing in Baytown and relax in the facility’s community room with complimentary beer tastings and snacks. No fee. Dress-up attire is expected for this afternoon of sandwiches, sweets and tea in the Phyllis Davis Room at 909 Decker Drive. No fee. The only clues you get for this trip are to dress comfortably and wear a sweater. Fee: $35, which includes a tour, transportation, lunch and a surprise or two. The island adventure will begin with a tour of the newly opened Bryan Museum, followed by lunch on your own and a private tour of the famed Rosenburg Library. Fee: $25. Catch the Tony Award-winning musical adaptation of one of the most romantic stories ever written, plus dinner in downtown Houston before the show. Fee: $45, which includes tickets and transportation only. Watch Neil Simon’s most successful romantic comedy as performed by one of the largest resident theater companies in the city, with dinner in the Galleria area before the show. Fee: $36, which includes tickets and transportation only.